Organ transplantations and surgical reconstructions using autografts and allografts have always been challenging. Apart from the complexity of the procedure, healthcare professionals also have difficulty finding compatible donors. Autografts derived from one part of the body may not fit in completely at the new location causing instability and discomfort. As per the U.S. Department of Health and Human Services, about 22 people die each day due to a shortage of transplantable organs. Creating more awareness about organ donation is only part of the solution. Researchers have to look for other alternatives, and this is where technologies such as three-dimensional medical printing and bioprinting are making an impact. Millions of dollars are being invested to develop technologies that will help healthcare professionals print muscles, bones and cartilages using a printer and transplant them directly into patients. The ITOP system is a big step in that direction. It was developed by researchers at Wake Forest Institute for Regenerative Medicine. They used a special biodegradable plastic material to form the tissue shape, a water-based gel to contain the cells, and a temporary outer structure to maintain shape during the actual printing process. The scientists extracted a small part of tissue from the human body and allowed its cells to replicate in vitro before placing them in the bioprinter to generate bigger structures. 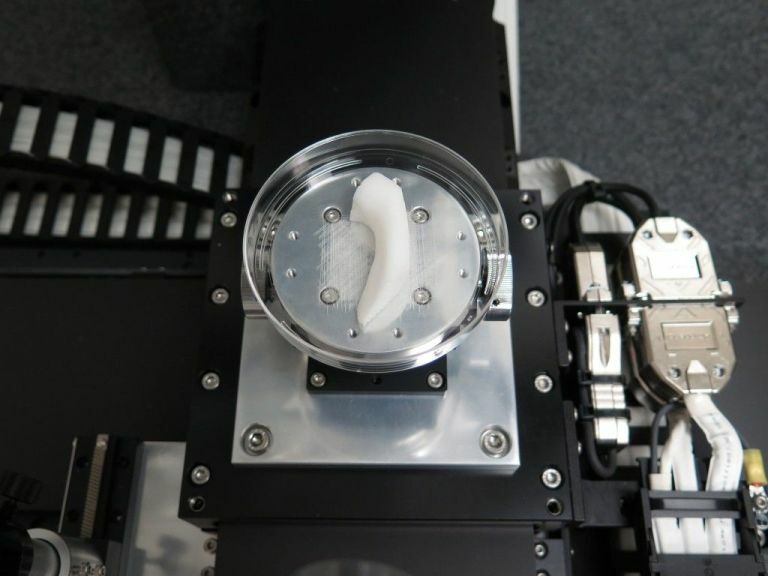 Unlike other 3-D printers, the ITOP system can print large tissues with an internal latticework of valleys that allows the flow nutrients and fluids. As a result, the tissue can survive for months in a nutrient medium prior to implantation. Researchers have used this technology to develop mandible and calvarial bones, cartilages and skeletal muscles. The goal is to create more complex replacement tissues and organs to offset the shortage of transplantable body parts. Researchers at John Hopkins are also developing 3-D printable bone scaffolds that can be placed in the human body. Their ingredients include a biodegradable polyester, known as Polylaprocaptone, and pulverized natural bone material. Polylaprocaptone has already been approved by the Food and Drug Administration (FDA) for other clinical applications. Researchers combined it with natural bone powder and special nutritional broth for cell development. The cells were added to a 3-D printer to generate bone scaffolds, which have been successfully implanted into animal models. Researchers at John Hopkins are now looking for the perfect ratio of Polylaprocaptone and bone powder that will produce consistent results. They will subsequently test their scaffolds in humans as well. More studies are being done as we speak. Many surgeons have also started using 3-D printed tissues and bones to help their patients. In the next few years, this technology will become more accessible, affordable and effective and may change medicine forever.